Albert Einstein was a famous Physicist from Germany, who lived between March 14, 1879 and April 18, 1955. He became 76 years old. He was a German theoretical physicist and Nobel laureate who is best known for having formulated the theory of relativity and the equation of the relationship between mass and energy (lots of energy law, E = mc Â²). Through the special theory of relativity revolutionized the mechanics, and emphasized the concept of time. He is considered to be one of the most important scientists of the 20th century. He was president of the Deutsche Gesellschaft Physikalisches 1916-18 and received the Nobel Prize in Physics in 1921, including for his discovery of the law of the photoelectric effect. He published more than 300 scientific works and 150 works on other subjects than physics, including about politics. 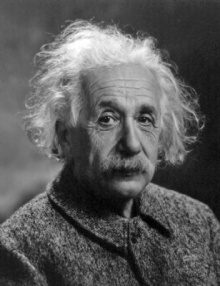 In popular culture, Einstein has become synonymous with high intelligence and the finest genius. His face is one of the most famous in the world, and in 1999 Einstein was named "Person of the Century" (Century person) by Time Magazine. He is born under the zodiac pisces, who is known for Fluctuation, Depth, Imagination, Reactive, Indecisive. Our collection contains 159 quotes who is written / told by Albert, under the main topics: Anger, Beauty, Death, Education, Equality. "The one who follows the crowd will usually get no further than the crowd. The one who walks alone, is likely to find himself in places no one has ever been"
"Isn't it strange that I who have written only unpopular books should be such a popular fellow?" "Love is a better teacher than duty"
"Memory is deceptive because it is colored by today's events"
"Morality is of the highest importance - but for us, not for God"
"Occurrences in this domain are beyond the reach of exact prediction because of the variety of factors in operation, not because of any lack of order in nature"
"Once we accept our limits, we go beyond them"
"One may say the eternal mystery of the world is its comprehensibility"
"One strength of the communist system of the East is that it has some of the character of a religion and inspires the emotions of a religion"
"Only one who devotes himself to a cause with his whole strength and soul can be a true master. For this reason mastery demands all of a person"
"Peace cannot be kept by force; it can only be achieved by understanding"
"People love chopping wood. In this activity one immediately sees results"
"Technological progress is like an axe in the hands of a pathological criminal"
"That deep emotional conviction of the presence of a superior reasoning power, which is revealed in the incomprehensible universe, forms my idea of God"
"The attempt to combine wisdom and power has only rarely been successful and then only for a short while"
"The devil has put a penalty on all things we enjoy in life. Either we suffer in health or we suffer in soul or we get fat"
"The distinction between the past, present and future is only a stubbornly persistent illusion"
"The faster you go, the shorter you are"
"The fear of death is the most unjustified of all fears, for there's no risk of accident for someone who's dead"
"The process of scientific discovery is, in effect, a continual flight from wonder"
"The pursuit of truth and beauty is a sphere of activity in which we are permitted to remain children all our lives"
"The release of atomic energy has not created a new problem. It has merely made more urgent the necessity of solving an existing one"
"The road to perdition has ever been accompanied by lip service to an ideal"
"The unleashed power of the atom has changed everything save our modes of thinking and we thus drift toward unparalleled catastrophe"
"To the Master's honor all must turn, each in its track, without a sound, forever tracing Newton's ground"
"Too many of us look upon Americans as dollar chasers. This is a cruel libel, even if it is reiterated thoughtlessly by the Americans themselves"
"True art is characterized by an irresistible urge in the creative artist"
"True religion is real living; living with all one's soul, with all one's goodness and righteousness"
"We cannot despair of humanity, since we ourselves are human beings"
"We shall require a substantially new manner of thinking if mankind is to survive"
"We should take care not to make the intellect our god; it has, of course, powerful muscles, but no personality"
"You cannot simultaneously prevent and prepare for war"
"A man should look for what is, and not for what he thinks should be"
"A perfection of means, and confusion of aims, seems to be our main problem"
"All that is valuable in human society depends upon the opportunity for development accorded the individual"
"All these primary impulses, not easily described in words, are the springs of man's actions"
"An empty stomach is not a good political adviser"
"Anger dwells only in the bosom of fools"
"Any intelligent fool can make things bigger and more complex... It takes a touch of genius - and a lot of courage to move in the opposite direction"
"Any man who can drive safely while kissing a pretty girl is simply not giving the kiss the attention it deserves"
"Any man who reads too much and uses his own brain too little falls into lazy habits of thinking"
"Anyone who doesn't take truth seriously in small matters cannot be trusted in large ones either"
"As far as I'm concerned, I prefer silent vice to ostentatious virtue"
"As far as the laws of mathematics refer to reality, they are not certain, and as far as they are certain, they do not refer to reality"
"Before God we are all equally wise - and equally foolish"
"Common sense is the collection of prejudices acquired by age eighteen"
"Concern for man and his fate must always form the chief interest of all technical endeavors. Never forget this in the midst of your diagrams and equations"
"Confusion of goals and perfection of means seems, in my opinion, to characterize our age"
"Do not worry about your difficulties in Mathematics. I can assure you mine are still greater"
"Everyone should be respected as an individual, but no one idolized"
"Everything should be as simple as it is, but not simpler"
"Everything that can be counted does not necessarily count; everything that counts cannot necessarily be counted"
"Few are those who see with their own eyes and feel with their own hearts"
"Few people are capable of expressing with equanimity opinions which differ from the prejudices of their social environment. Most people are even incapable of forming such opinions"
"Force always attracts men of low morality"
"God always takes the simplest way"
"I am not only a pacifist but a militant pacifist. I am willing to fight for peace. Nothing will end war unless the people themselves refuse to go to war"
"I believe that a simple and unassuming manner of life is best for everyone, best both for the body and the mind"
"I cannot imagine a God who rewards and punishes the objects of his creation and is but a reflection of human frailty"
"I do not believe in immortality of the individual, and I consider ethics to be an exclusively human concern with no superhuman authority behind it"
"I do not believe in the God of theology who rewards good and punishes evil"
"I do not believe that civilization will be wiped out in a war fought with the atomic bomb. Perhaps two-thirds of the people of the earth will be killed"
"I have just got a new theory of eternity"
"I live in that solitude which is painful in youth, but delicious in the years of maturity"
"In matters of truth and justice, there is no difference between large and small problems, for issues concerning the treatment of people are all the same"
"In order to be an immaculate member of a flock of sheep, one must above all be a sheep oneself"
"Intellectuals solve problems, geniuses prevent them"
"It's not that I'm so smart, it's just that I stay with problems longer"
"Most of the fundamental ideas of science are essentially simple, and may, as a rule, be expressed in a language comprehensible to everyone"
"Pure mathematics is, in its way, the poetry of logical ideas"
"There is no logical way to the discovery of these elemental laws. There is only the way of intuition, which is helped by a feeling for the order lying behind the appearance"
"Things should be made as simple as possible, but not any simpler"
"Time is what prevents everything from happening at once"
"Weakness of attitude becomes weakness of character"
"When I examine myself and my methods of thought, I come to the conclusion that the gift of fantasy has meant more to me than any talent for abstract, positive thinking"
"You can never solve a problem on the level on which it was created"
"God may be subtle, but he isn't plain mean"
"I never think of the future - it comes soon enough"
"It was the experience of mystery - even if mixed with fear - that engendered religion"
"There are two ways to live: you can live as if nothing is a miracle; you can live as if everything is a miracle"
"Nothing is more destructive of respect for the government and the law of the land than passing laws which cannot be enforced"
"Never do anything against conscience even if the state demands it"
"No amount of experimentation can ever prove me right; a single experiment can prove me wrong"
"Small is the number of people who see with their eyes and think with their minds"
"There could be no fairer destiny for any physical theory than that it should point the way to a more comprehensive theory in which it lives on as a limiting case"
"He who can no longer pause to wonder and stand rapt in awe, is as good as dead; his eyes are closed"
"He who joyfully marches to music in rank and file has already earned my contempt. He has been given a large brain by mistake, since for him the spinal cord would suffice"
"I think and think for months and years. Ninety-nine times, the conclusion is false. The hundredth time I am right"
"It stands to the everlasting credit of science that by acting on the human mind it has overcome man's insecurity before himself and before nature"
"The gift of fantasy has meant more to me than my talent for absorbing positive knowledge"
"To raise new questions, new possibilities, to regard old problems from a new angle, requires creative imagination and marks real advance in science"
"It is my conviction that killing under the cloak of war is nothing but an act of murder"
"The monotony and solitude of a quiet life stimulates the creative mind"
"It is only to the individual that a soul is given"
"Most people say that is it is the intellect which makes a great scientist. They are wrong: it is character"
"Reading, after a certain age, diverts the mind too much from its creative pursuits. Any man who reads too much and uses his own brain too little falls into lazy habits of thinking"
"The grand aim of all science is to cover the greatest number of empirical facts by logical deduction from the smallest number of hypotheses or axioms"
"The hardest thing to understand in the world is the income tax"
"When you are courting a nice girl an hour seems like a second. When you sit on a red-hot cinder a second seems like an hour. That's relativity"
"I shall never believe that God plays dice with the world"
"I want to know all Gods thoughts; all the rest are just details"
"If people are good only because they fear punishment, and hope for reward, then we are a sorry lot indeed"
"My religion consists of a humble admiration of the illimitable superior spirit who reveals himself in the slight details we are able to perceive with our frail and feeble mind"
"Politics is for the present, but an equation is for eternity"
"We still do not know one thousandth of one percent of what nature has revealed to us"
"Whoever is careless with the truth in small matters cannot be trusted with important matters"
"It gives me great pleasure indeed to see the stubbornness of an incorrigible nonconformist warmly acclaimed"
"Joy in looking and comprehending is nature's most beautiful gift"
"Knowledge of what is does not open the door directly to what should be"
"Learn from yesterday, live for today, hope for tomorrow. The important thing is not to stop questioning"
"Let every man be respected as an individual and no man idolized"